Cradled by the Blue Ridge and the massive Jefferson National Forest, historic Abingdon is an outdoor wonderland. The nearly 250-year-old Appalachian town has a richly colorful past— and a long history of welcoming visitors. A longtime Cherokee hunting ground, the area was christened Black’s Fort when Europeans began trickling into the region in the middle of the 18th century. It was redubbed “Wolf Hills” when, according to local lore, Daniel Boone was attacked by wolves while hunting nearby. For decades the town served as a final outpost for settlers heading westward on the Great Wilderness Road—and featured the very first Post Office west of the Blue Ridge. The town’s name was changed once again—this time, to Abingdon—as a homage to First Lady Martha Washington’s ancestral home, Abingdon-on-Thames, in Oxfordshire. Today, natural wonders and vivid history still abound in Abingdon. Hike, bike, or paddle Southwest Virginia’s vast wild spaces. Take your time wandering the historic streets of Abingdon, discovering the region’s rich cultural heritage, and all the while soaking up the town’s legendary hospitality. 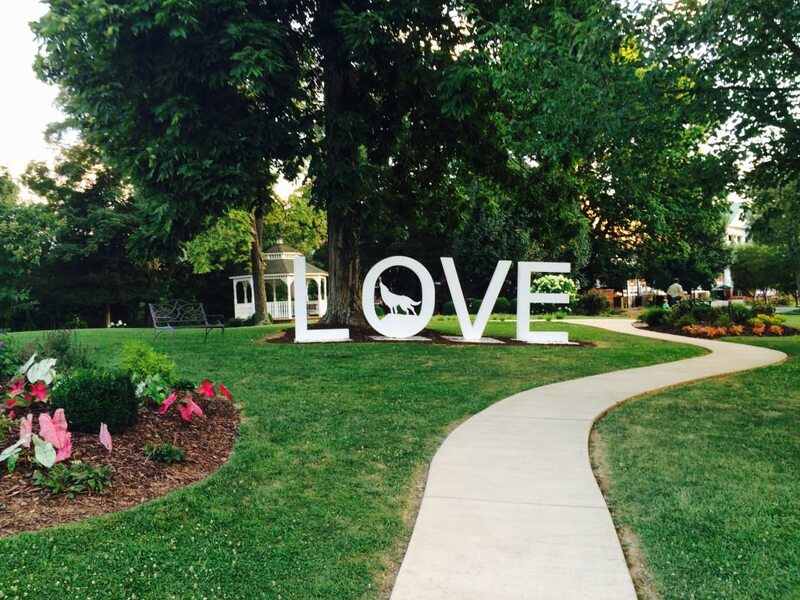 After 48 hours in Abingdon, you’ll leave wishing you were staying much longer than just the weekend. Begin at the bountiful Abingdon Farmers Market (Saturdays from 8 a.m. to 1 p.m.). Swing by the Balkan Bakery stall and grab some freshly baked croissants to nosh while you peruse the market’s locally raised produce, baked goods, crafts and handmade delicacies. 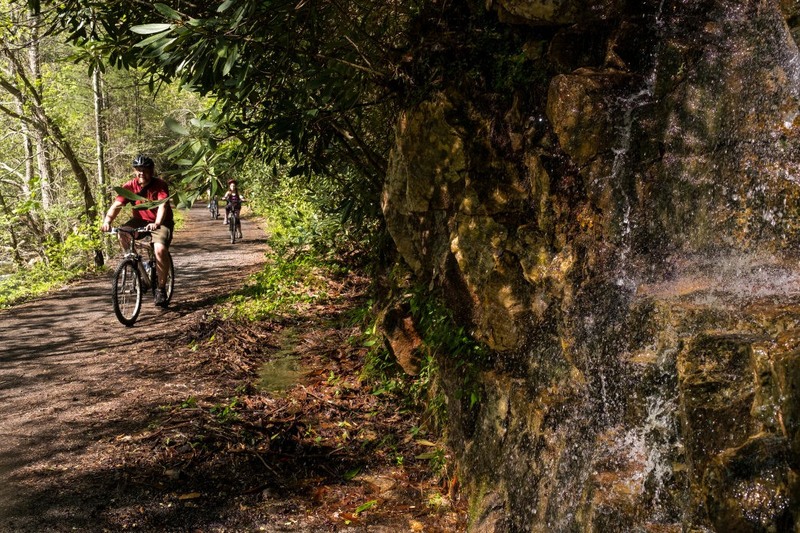 After the market has piqued your senses, head over the trailhead for the Virginia Creeper Trail to get your heart racing too. Hike, bike, or run a stretch of the leafy 34-mile trail, named for the sluggish locomotives that once chugged through town on the way to North Carolina. On the way from Abingdon to the midway point in Damascus, the trail rambles past sunlight-dappled meadows, rolling horse pastures—and for an extended stint, it also hugs the best trout fishing stream in Virginia, Whitetop Laurel Creek. If you didn’t bring your bike, rent a pair of wheels at the Virginia Creeper Trail Bike Shop, just a few steps from the trailhead in Abingdon. The bike shop can also arrange shuttle transport to accommodate a ride of any length. If you need to break up your hike, ride, or run on the Virginia Creeper, you can always pop into the Abingdon Vineyard and Winery for a tasting (or an excuse for a breather). The inviting winery is located just a half-mile from the trail. Spend the afternoon relishing in some well-deserved, post-trail pampering at the Martha Washington Inn & Spa in the center of town. 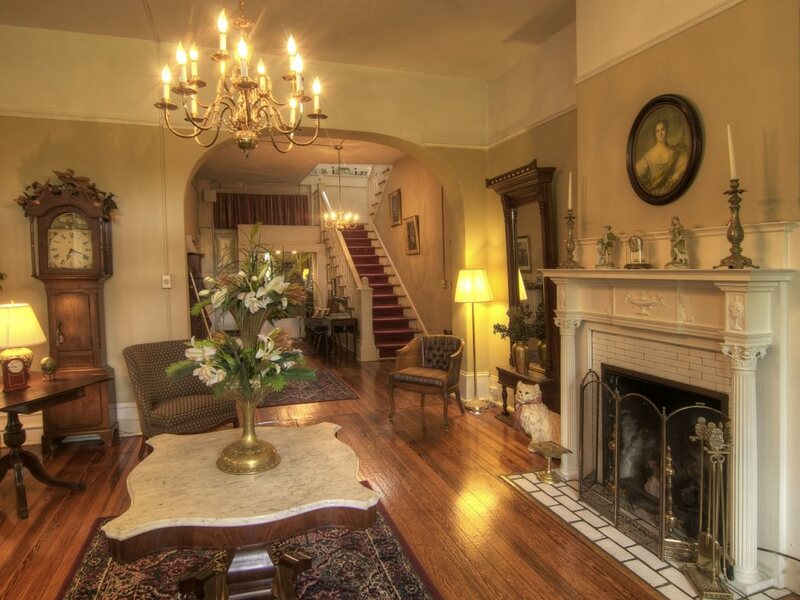 The exquisite accommodation has been hosting guests since 1935. Opt for a private couples massage or just regroup with a round at the inn’s cozy bar. After “the Martha” has rejuvenated you, meander down Main Street to the Tavern, the oldest, and according to local lore, one of the most haunted establishments in town. Functioning as everything from a roadside inn to a post office during the Civil War, the Tavern was even converted into a hospital, accepting both Confederate and Union wounded. Today, the Tavern’s bar is still the oldest in Virginia. Peruse the lengthy wine list and be sure to try the brie-filled bread bowl—coated with honey, brown sugar and toasted almonds. If the place isn’t too busy, you can even ask for a tour. Look for the charcoal bed numbers still adorning the walls of the attic, a lingering testament to the Tavern’s time as a Civil War hospital. Seize the day with a cup of fresh, locally roasted coffee at Zazzy'z Coffee House and Roastery before making your way to the spectacular Grayson Highlands State Park, driving along the Mount Rogers Scenic Byway. If you are itching to stretch your legs on route, make a pit stop at Elk Garden, in the stunning Lewis Fork Wilderness section of the vast Mount Rogers National Recreation Area. For a brief but picturesque 3-mile loop, loaded with views of the famed high Appalachian balds, hop on the Appalachian Trail for 2-miles, heading toward Deep Gap, and return on the Virginia Highlands Horse Trail, hiking a mile back to the Elk Garden Park Area. After Elk Garden, continue winding toward the Grayson Highlands and head for the park’s overnight backpackers lot. For a scenic out-and-back hike, hop on the Appalachian Spur Trail (which connects to the Appalachian Trail after about a mile). Follow the Appalachian Trail as it rambles through tunnels of Rhododendron, over scenic saddles, and through expansive alpine meadows. Keep your eyes peeled for the park’s illustrious wild ponies—several grazing herds have been roaming the highlands for just over 40 years, first introduced by the National Park Service to reduce the risk of forest fires. When you are ready for a break, stop and linger over the seeming endless views of the rippling Blue Ridge before retracing your steps back to the parking area. Back in Abingdon, recount the highlights of your hike over another cherished Appalachian tradition—perfectly smoked barbecue—at the BoneFire Smokehouse. After lunch, stroll over to the Wolf Hills Brewery. Sample some of the establishment’s outdoor inspired craft beers, like the Creeper Trail Ale or the White Blaze Honey Cream Ale. Learn about the brewery’s commitment to sustainability, including donating excess brewing grain to area farmers to use as animal feed. 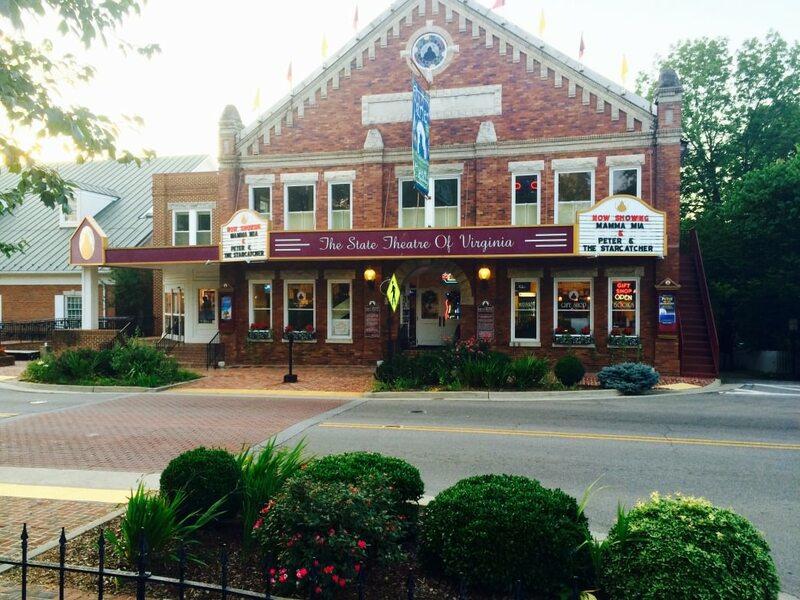 Cap off your weekend at one of Abingdon’s most enduring treasures—the Barter Theatre. Established in 1933, performers like Gregory Peck, Patricia Neal, and Kevin Spacey have all graced the Barter Theatre’s stage. The venue even famously survived opening in the midst of the economic turmoil of the Great Depression by accepting farm produce in exchange for theatre tickets. Today, the Barter Theatre still showcases performances on two different stages. Shows typically begin at 3 p.m. and 7 p.m. on Sundays.